You can look in the dictionary but you probably won’t find any superlatives that haven’t already been used to describe Roger Federer. For me, he’s the greatest tennis player who has ever lived and probably ever will live. He’s nearly 36 and he just won Wimbledon without dropping a set. The locker room is in awe. The sporting world is agape. The question now moves on to whether this absurdly cool, calm and charming Swiss can also be called the greatest athlete, at least in this present age. No question Federer would have scores of challengers for that title and I would never question the credentials of a Magic or a Shaq or Messi or Ronaldo or Bolt. But Federer’s achievements, along with any tennis player, have to be put in this context: they have to be done alone. So, you might say, does Usain Bolt but the Jamaican, God bless him, only has to run. He doesn’t have to stop, swivel & hit an inch perfect volley at the end of that run. Tennis stands alone – with boxing as a challenger – as a sport that requires the full range of physical possibilities – the fastest footwork allied to lightening fast sprints; 20/20 vision & perfect hand to eye co-ordination; greater strength than you might imagine; endurance; relentless concentration and the fierce will to overcome an opponent who is doing his or her level best to stop you hitting your best shot. And you have to do all that alone. No one to pass to; no chance of taking a couple of minutes to re-group & get your act together. Blink and you have lost your serve. No wonder tennis players get mentally tired. Only in cricket, where a batsman can be out; gone, back in the pavilion, after just one mistake – compare one netted volley if you like – is the pressure on a player not to err even greater. So all this needs to be taken into consideration when evaluating where Roger Federer stands in the pantheon of exceptional champions in any sport. Personally, I think he stands very high. There are those who will argue – Paul McNamee, on Twitter, among them – that Federer’s losing record in big matches against Rafa Nadal and Novak Djokovic demands evaluation and that’s fair. However, year ago, when Federer limped out of Wimbledon at the age of 35 with a bad knee, the talk was of whether it would be Nadal or Djokovic who would catch him in the Grand Slam stakes. At the time, Federer had 17. Now the figure to chase is 19. Nadal has added one to his 2016 total of 14, Djokovic 0. And, unfairly, perhaps, style has to come into it, too. Federer plays with such elan, such grace, such beauty that these factors are impossible to ignore. So the whole Federer package ended up saving the men’s singles at this year’s Wimbledon. Unhappily the final turned out to be a non-event because Marin Cilic had such a big blister on his foot that he couldn’t move laterally. Tears at the start of the second set revealed the extent of the Croat’s agonized frustration at not being able to play at his best in the most important match of his life. And the tears were not just for himself. He knew just how many people back home were depending on him and he felt he was letting them down. Cilic has the game to challenge again and eventually win Wimbledon but it would help, perhaps, if he, like just about every other player, learned to be more comfortable at the net. In his Monday press conference, Federer made reference to the fact that his task had been made so much easier on worn courts that were playing faster this year because his opponents had been advancing to the net only 2% of the time. “Learn to volley,” was the instruction from The Master, words that were directed at coaches as well. I lost count of the number of interviews Federer had done the previous evening, using any of his three languages, but it took him hours. Then the dinner, then the drinking.. but he was not going to miss his 10.00 am commitment. In the media, we think he’s a bit of a champion for these reasons as well. 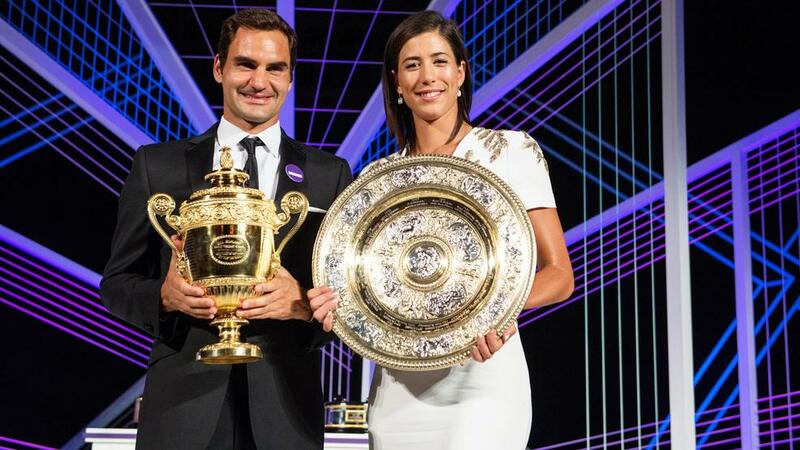 However, if Federer hogged the headlines on Sunday, Saturday had belonged to a new Wimbledon Champion and the tennis world is hoping that she will be back for more. Garbine Muguruza – tall, tanned.well, no she’s not from Ipanema but this superbly athletic young woman carries that bit of South American flair with her on court, having been born in Venezuela, even though she now plays under the Spanish flag. With Venus Williams unable to sustain her attempt to win a 6th Wimbledon title, fading with a sudden, unexplained rapidity after losing a close first set, Muguruza emerged to enjoy well-earned acclaim but, although she is great news for women’s tennis, she is not the only reason for the ladies to feel so elated after these Championships. Overall, it was the women who produced the highest quality of match play throughout the fortnight. Three of the best matches I have been to all year came out of the women’s draw and were made all the more exciting by the fact that Johanna Konta, Britain’s bright new star, was involved in two of them. Konta’s knife edge 7-6, 4-6, 10-8 defeat of the vastly improved Donna Vekic was not an epic solely because of the score line. The standard of tennis was mesmerizing, sending the Centre Court into paroxysms of delight as both players, while serving brilliantly, had to dig themselves out of 0-30 situations, so well were they returning in the final stages. Konta told us afterwards that she kept her cool by acknowledging how well Vekic was playing, expecting her to come up with another great serve and accepting it. “I just concentrated on what I needed to do well,” she said. It’s a champion’s mentality and although she found Venus just too powerful for her in the semi-final, there is no reason why Konta cannot become Britain’s next Wimbledon champion. In many ways, her victory over Simona Halep by 6-7, 7-6, 6-4 was just as riveting and offered as good an exhibition of highly competitive, top notch tennis as we saw all fortnight. Unfortunately, the match that, if anything, surpassed these two for quality did not make it onto a big stage. Angelique Kerber, the world No 1 – at least for that moment – and Muguruza, who after all was a former finalist, were put out on Court 2. The scheduling aroused cries of despair from those who feel that the women aren’t give a fair share of the limelight at Wimbledon but that’s an argument for another day. What is undeniable is that you could not have seen a better battle from anyone than this epic in which Muguruza, utilizing her attacking skills to the full, striding forward to volley with great dexterity, finally found a way through the stoic German defenses to win 4-6, 6-4, 6-4. Kerber seemed impregnable in the first set, but the Spaniard, who seems so much calmer and more confident with temporary coach Conchita Martinez at court side, found a way through – never panicking when yet another return came back but hammering away with huge ripostes of her own until the resistance cracked. Some of the rallies left one blinking in disbelief. So the women’s game has done itself no harm at all at Wimbledon 2017 and the hope is that Venus has not done so either. The feat of reaching the final at the age of 37, having battered young pretenders like French Open champion Jelena Ostapenko 6-3, 7-5, not to mention Konta, along the way, was astonishing. So hopefully it was just a temporary lapse and Venus will be able to maintain the exceptional level of tennis she has been producing all year. She is an inspiration, just like Federer has been for so many years and, one hopes, Muguruza will be in the future.